Production Time: Ships in approx. 3 - 5 business days. 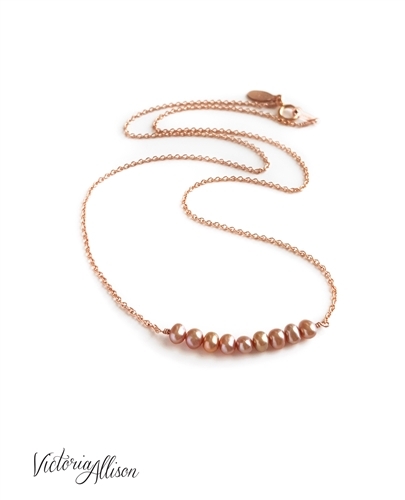 The row of teeny tiny pearls have a very pretty subtle iridescent hue. They are real pearls (not glass/fake,) so please allow for subtle variation from one to the next. 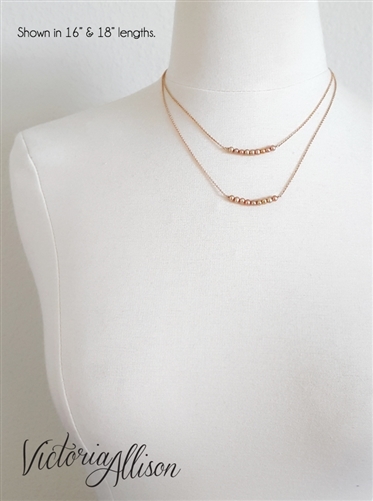 They are the perfect compliment to the delicate rose gold chain. The pearl section measures a little over 1-inch/2.54cm wide. Made to Order - this necklace will be handmade to your chain length specifications upon order. 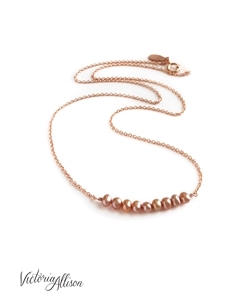 You may choose a length between 16-inches/40.5cm up to 20-inches/51cm in 14/20kt rose gold-filled chain, finishing with a spring clasp closure. Gold-filled chain offers a more durable finish than gold plated chain. The photo on the dress-form shows two of this design, in 16" and 18" lengths. Each piece of jewelry is sent in my standard logo gift box tied with a ribbon, ready for gift giving or receiving!